Clancy wrote a string of best-selling spy and military thrillers. His 17th novel, Command Authority, is due out in December. Several of his books featuring CIA analyst Jack Ryan have been adapted into successful Hollywood films. The former insurance broker died in a Baltimore hospital near his Maryland home, according to reports. Clancy, who died on Tuesday, was remembered as “a master of his craft” by Tom Weldon, chief executive of Penguin Random House UK. Written in his spare time, The Hunt for Red October (1984) was Clancy’s first published novel and sold more than five million copies. President Ronald Reagan helped to fuel the success of the book when he called it a “perfect yarn”. The novel was made into a film in 1990, starring Alec Baldwin as Ryan and Sir Sean Connery as Soviet submarine captain Marko Ramius. Baldwin paid tribute to “the great writer Tom Clancy” on Twitter, remembering him as “a real gentleman of the old school”. Harrison Ford went on to play Ryan in film versions of Patriot Games and Clear and Present Danger, while Ben Affleck played him in 2002 release The Sum of All Fears. Jack Ryan: Shadow One, a new film to feature the character directed by Sir Kenneth Branagh, is set for release this December. Clancy usually wrote a book a year, making him one of the wealthiest authors in the world. In 2002 he was ranked at 10 in Forbes magazine’s Celebrity 100 list with estimated earnings of $47.8m (£33m). As well as a successful writer, Clancy also became closely associated with the world of video gaming. In the 1990s he founded Red Storm Entertainment, later bought by Ubisoft, which developed games based on Clancy’s ideas. Blockbuster video game titles bearing his name included Splinter Cell, Ghost Recon and Rainbow Six. “Tom Clancy was an extraordinary author with a gift for creating detailed, engrossing fictional stories that captivated audiences around the world,” said Ubisoft on its Facebook page. British author Barbara Taylor-Bradford also paid tribute to Clancy on her website. Clancy was known for his technically detailed espionage and military science storylines. One, written in 1994, told of a crazed Japan Airlines pilot who flies into the Capitol building in Washington. In a 2003 interview, CNN presenter Wolf Blitzer suggested his precise accounts of the US military techniques were giving away secrets to terrorists. “I never got any fan mail from Osama bin Laden, and I don’t really know how many books I sold in Afghanistan,” the author replied. “He was ahead of the news curve and sometimes frighteningly prescient,” said Ivan Held, president of Penguin imprint G P Putnam’s Sons. 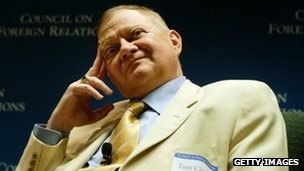 RIP Tom Clancy, God rest your soul.